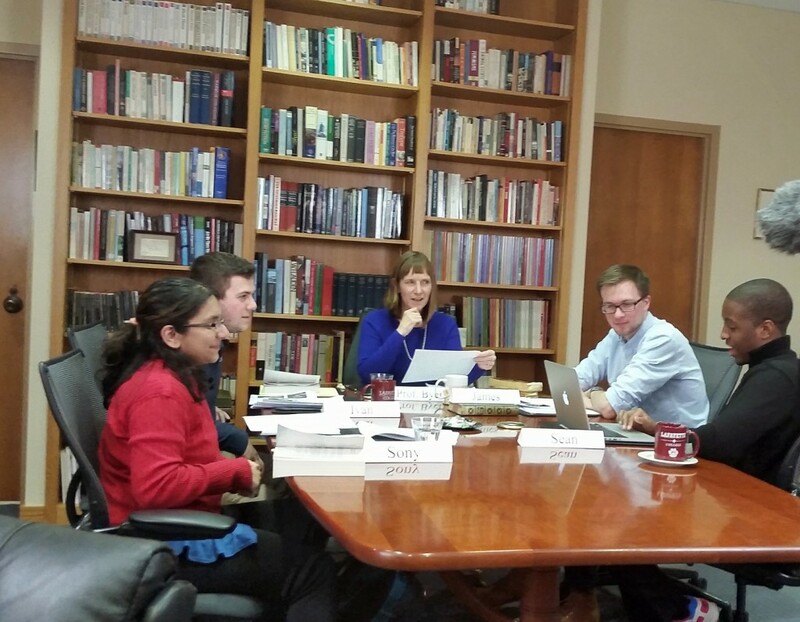 President Alison Byerly leads a discussion at last year’s course. ConnectEd, Lafayette’s online learning program, connects students past and present with outstanding faculty for learning in a whole new way. The series of three one-week, non-credit online courses is open to students, alumni, faculty, and staff in January. “The program offers our alumni the opportunity to continue to learn from Lafayette faculty, and gives our faculty the opportunity to experiment with a new format for conveying their deep love of their subject matter,” says President Alison Byerly. The program is now in its second year, and each course will involve shared assignments, including readings and online videos. There will also be live discussion sessions allowing participants to exchange ideas and debate concepts. Byerly will offer the first course, Faculty Book Review, Jan. 4-8. She will host a group of students and discuss recent books with three faculty authors. Donald Miller, MacCracken Professor of History, will discuss his wide-ranging cultural history of New York, Supreme City: How Jazz Age Manhattan Gave Birth to Modern America. Lee Upton, Francis A. March Professor of English and writer in residence, will talk about her new poetry collection, Bottles The Bottles The Bottles, as well as her collection of short stories, The Tao of Humiliation. Bruce Murphy, Kirby Professor of Government & Law, will discuss Scalia: A Court of One, his compelling biography of the controversial Supreme Court justice. Mary Jo Lodge, associate professor of theater, will teach the course The Uniquely American Musical: Broadway and the American Dream, Jan. 11-15. The course will examine how the Broadway musical is the perfect medium to capture stories that focus on achieving that uniquely American Dream of upward mobility, power, freedom, and prosperity. Participants will study the musical as an artistic form looking at shows like Show Boat, Oklahoma, West Side Story, and the new smash hit Hamilton. The final course, The Miracle of Flight: Designing a Dream, will be taught Jan. 18-22 by Jenn Rossmann, associate professor of mechanical engineering. The session will explore flight’s techno-cultural history, highlighting the engineering breakthroughs that enabled manned flight as well as discussing the way flight has been portrayed in art, literature, and film. The class will consider wind tunnel experiments and the Wrights, Wings, and war, and beyond.